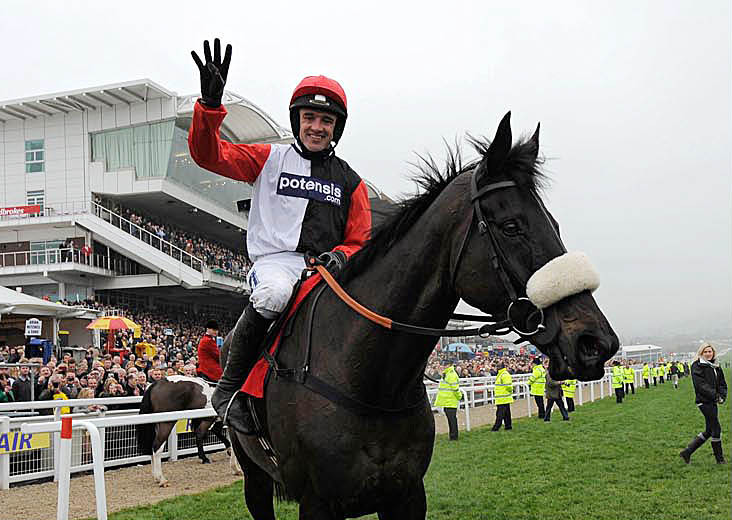 Can Big Bucks capture his 5th World Hurdle crown? Can Big Bucks really claim his 5th World Hurdle crown? Can Bucks rule the World for a 5th time? It goes without saying that it’s fantastic to have a champion like Big Bucks back on the track, or at least back on track this weekend, but let’s be serious, he is now an 11yo and he has been off the track for nigh on 14 months so can we really expect him to slot straight back in where he left off? The World Hurdle has seen some well above average staying hurdlers in recent years with the likes of Baracouda, Iris’s Gift and the indomitable Inglis Drever dominating the division, but it is fair to say that the mighty Big Bucks outstrips them all. Since his Hennessy Gold Cup debacle he has proven to be the monster of the staying division, the unbeatable beast, but will a 14th month absence and the bugger that is father time leave him susceptible to younger rivals? In that time frame 21 horses aged 10 or older have run in the race, none have won and only 3 have placed. Baracouda attempted to win it as a 10yo and an 11yo but both times coming up short, finishing 2nd & 5th. To add a bit more flesh to that stat it should also be considered that since the race was first run in its current format (1972) only ONE horse has won the race aged 10yo+! For the record that was Crimson Embers in 1986. It really isn’t a race for the older generation so can Bucks stick two fingers up at father time? At the last 6 Cheltenham Festivals, in NON-Handicap events, there have been 148 runners aged 10yo or older and only 3 have won! At the last 6 Cheltenham Festivals, in NON-Handicap events, there have been 81 runners aged 11yo or older and………NONE have won! Both of those angles are under-performing on market expectations and it fully highlights that the high-octane environment at the Cheltenham Festival is a difficult place for ageing legs. Can Big Bucks overcome the World Hurdle stat whilst at the same time becoming the first 11yo to win a Non-Handicap race at the Festival since Moscow Flyer in 2005? Big Bucks has had 31 Hurdle starts so far, Saturday will be his 32nd hurdle run (39th career start if we include Chase runs). Big Bucks has actually defied that stat on his last 2 World Hurdle victories but his career runs are starting to add up, wear and tear must start to become an issue at some stage, his runs have mostly been at the top levels against the best stayers around AND he has been on the go since he was a 3yo. Add to the fact he has just been off the track for almost 14 months can we really expect him to slot straight back in where he left off as a ‘fresh faced’ 11yo on his 39th career start? The other aspect I have noted about Big Bucks and his 4 World Hurdle wins are the RPR figures he has recorded in victory. I think it’s interesting that he has yet to match the figure he achieved when winning his first crown. Maybe he hasn’t needed to of course but that first win was his peak performance figure at Cheltenham and he has been below it on each of the subsequent 3 victories. Can he reproduce the 170 figure he achieved 2 years ago or will he dip to the 160’s, potentially leaving the door open for someone else? Doors to the NTF Cheltenham Festival Service close on Sunday 9th of March!! …as you can see it is a similar story on that scale as well. It is extremely difficult to keep firing in those figures at the top levels, year after year, but to be a champion it has to be done. Big Bucks has had enough class to get the job done in the past but he has had relatively smooth progression through each of those seasons, he was at the top of his game through the peak ages for a stayer. At 11 and after his 14 month absence can he still produce those figures and keep ahead of the chasing pack? Is now the time for a new dominant force to step up and claim the stayers glory? But what do the NTF massive (that’s you guys by the way!) think about his chances? It’s time to get your voting hats on and make your opinion known! …and as a thanks for expressing your opinion here is the original ‘BIG BUCKS’ super fan, Sir Mix-A-Lot….